Raksha Bandhan is that one festival that every Brother and Sister looks forward to. It gives us the opportunity to strengthen the bond gifted to us by the God. 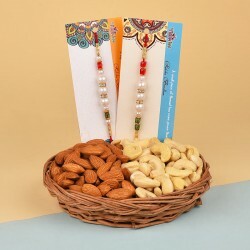 With these beautiful Raksha Bandhan Gift Hampers, wishing the siblings becomes even more meaningful. 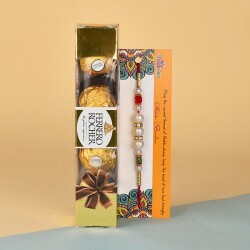 These perfect Raksha Bandhan goodies are available to you online so that you can wish your Brother or Sister without worrying about the time or the distance between you two. Raksha Bandhan is the perfect time to show your Brothers and Sisters how much they mean to you. We often fail to show our emotions to them but on the Raksha Bandhan, let your heart out and tell them how much they are adored by you with MyFlowerTree's special Raksha Bandhan Gift Hampers. We have everything that you need to make this Raksha Bandhan better than before. Make your celebrations grand by sending a Gift Hamper to your childhood partner in crime from MyFlowerTree. A Sister ties a Rakhi on the wrist of her Brother and presents him with some sweets and Gifts. 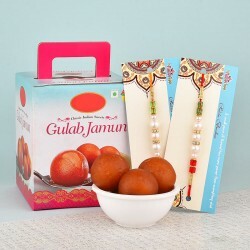 Gift Hampers for Brothers includes various things that he would require in his day to day life. For example after shave lotion, Perfume, Towels, Belts, Stationary, Razor and more. So, we have included apparels, personal care products, fragrances and more in this section. You will also find beautiful Rakhis with motifs of Peacocks, Flowers, Ganesha, Elephants and more. 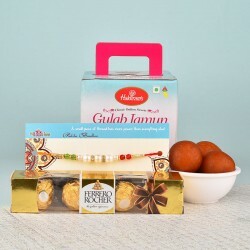 We have Rakhi with Chocolates too! 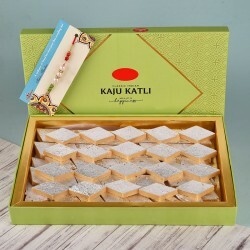 We also have special Raksha Bandhan Thalis which contain, Roli, Chawal and Tika along with other goodies. In exchange for a Sister's Rakhi, a Brother promises to protect her for the lifetime and gives her some Gifts in return. Since your Sister is pretty special, we wanted to make gifts for her which are special like her. 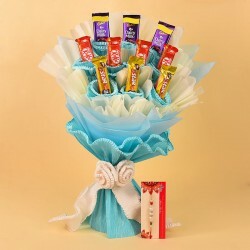 Females love Flowers, so we made sure that our gift hampers include a lot of them. These Gift Hampers have some of the most exquisite jewelleries which are made with beautiful stones, pearls, silver and other beads. No gift hamper can be complete without Fragrances for the beautiful Sister. We also have some delicious Chocolates for her. 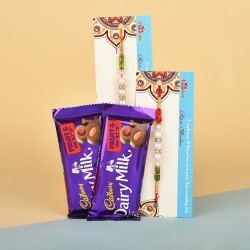 Send Rakhi chocolate gift hampers to your sweet sister this 26th August and make it extra sweet! Kids are the ones who add a touch of freshness in everything that they touch. They teach us the correct way to enjoy every festival. On this Raksha Bandhan, do something special for them as well. We have amazing Gift Hampers for Kids which includes toys, games, soft toys, chocolates, cakes. We also have Kids special Rakhis that have mini Doraemon, Superman, Ganesha and Shin Chan on them. When you get to celebrate Raksha Bandhan with both Bhaiya and Bhabhi, it's double the fun! If you are a lucky Sister who is going to celebrate this Raksha Bandhan with a happy couple, better make it worth it. 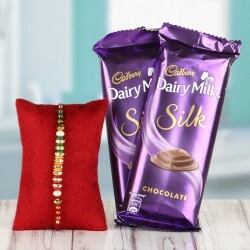 Our Bhaiya Bhabhi Raksha Bandhan Gift Hamper includes couple gifts, Dry Fruits, Sweets, Cakes, perfumes, Rakhi gift baskets, Jewellery, Soft Toys and More. 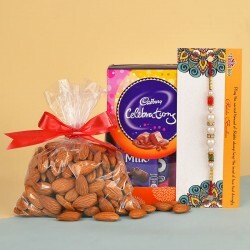 We have special Kundan Rakhi, Silver Rakhi and Loombas for the Bhaiya and Bhabhi. 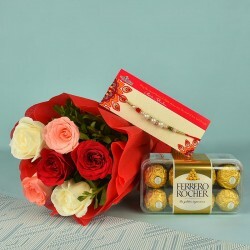 You can surprise the happy couple with Rakhi with Flowers on this special day. The wait is over. All the perfect Gifts are here! Flowers, Cakes, Chocolates, Rakhis, Fragrances, Soft Toys, Mugs, Cushions, Dry Fruits and more. You will find everything that you need to make this Raksha Bandhan perfect right here at MyFlowerTree. Special Rakhi with Thalis are ready to make this Raksha Bandhan memorable. Just place your orders know and leave everything on us. We will deliver your gifts at the right time and at the right place. Enjoy this festival with even more delight. 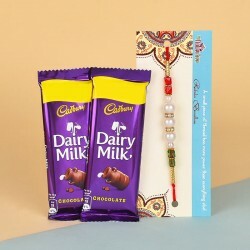 Even if your siblings live outside India, you can send Rakhi gift hampers to any international location including USA, Australia, Canada, Germany, Qatar, France, Malaysia, South Africa, Sweden, UAE, UK, Singapore, to name a few. Simply choose our International gift delivery option and make it an unforgettable experience for them to remember and cherish.